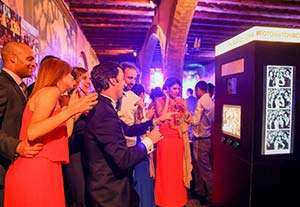 The Fotomaton service for weddings and parties is ideal for having fun and offering entertainment to your guests, as well as an endearing personalized keepsake. 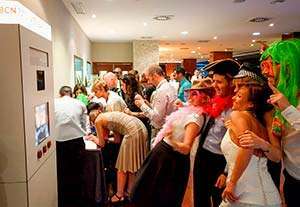 Enjoy yourself with the costumes and pose in front of the photo booth. Print all the copies that you need and reserve one for the autograph album. The service is unlimited. You can have any many photo sessions as you wish, and you can also have all the copies printed that you want. The strips can be personalized by changing the background or adding logos, names, and dates. Kit composed of 50 elements: giant glasses, wigs, hats, necklaces, headbands, stick costumes, and masks. 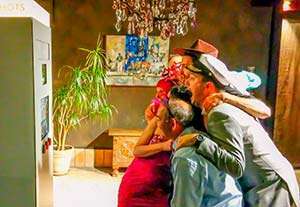 The costumes can be used all around the party, not just in front of the photo booth. Fotomaton Barcelona rental includes a staff operator for the duration of the service to help and assemble the photo booth album. They are also there to resolve any doubts or issues that could arise. 31x31cm album with space for a cover photo. Available in 3 colors. 60 pages with tissue paper between them. It is delivered at the end of the service (material and assembly service included). 1 large frame 120x100cm. 1 medium frame 90x86cm. After the event, they’ll be yours to keep. Add adhesive magnets to the back of the photo strips to be able to hang them on the refrigerator. Enhance the memory of your wedding! Build up automatic GIFs with photo booth service. Best way to show up you digital memories. Set up a backdrop on your photo booth photos. Ask for a personalized backdrop unique for your party. Let your guests print the photos from their mobile phone uploaded to Instagram with the hashtag of your party. 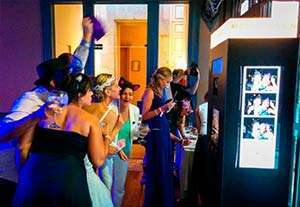 Your guests will be able to print photos from any spot at the wedding. Two 45cm letters of solid wood for the guests to pose with in the photo booth photos. The perfect accessory to personalize your service. 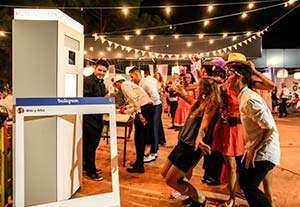 The premium model photo booths include a vertical high resolution screen on one side with an automatic slideshow of all the photo strips that are being made during the event. An essential accessory for the photo booth strips to be displayed vertically on your shelves. Rent wooden light-up letters to decorate your wedding or party. They can be used as a backdrop for group photos. Enjoy having a professional photographer on the red carpet to add a touch of glamour.